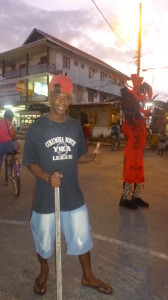 Home Activities Diablos Have Invaded Bocas and Carnaval is Here! 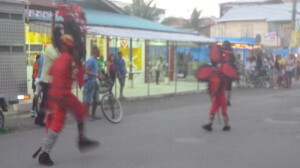 Diablos Have Invaded Bocas and Carnaval is Here! 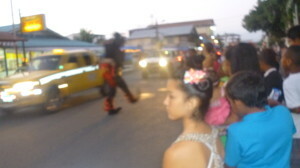 With Carnaval just around the corner, the streets of Bocas Town are being invaded every afternoon by diablos, or “devils”. Every afternoon at about 6:30 the diablos hit the streets to entertain the people with their enchanting ceremonial stomping and to challenge the local boys to impromptu duels with their whipping sticks. If you’ve ever been in Bocas during Carnaval time than I bet you’re more than familiar with the whipping sticks, ceremonial stomping and the jingling sound of the bells that the diablos have sewn onto their costumes. If you happen to find yourself between the white lines of the street during this time of year, you’re in diablo territory and are fair game for whipping. That is why you’ll see the guys with their trusty sticks for fending off the devils. Below is a picture of Trey, ready for battle. You’ll notice that there are red, black and white diablos. The colors indicate seniority. The diablos are like any fraternal organization: they recruit new members and participate in rituals of initiation. There are diablos as young as 6 years old. When the boys begin, their costume is completely red. Each year they add a piece of black until their costume is all black. It takes 7 years to become a black diablo and after 14 years total, you can begin to add white pieces. Although there are no completely white devils, you can tell a high ranking diablo by the amount of white pieces he has. So what the devil is this diablo madness all about? I interviewed a bunch of Bocas locals on the matter and received mixed reports. No one seems to agree on the symbolism of it all. What is for sure is the diablo custom originates in the Caribbean port town of Portobelo, Panama. 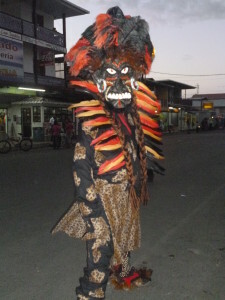 Although Carnaval is celebrated in all parts of Panama, the diablo tradition is exclusive to Portobelo and Bocas del Toro. Some Bocas people say that the diablos are meant to represent the Spanish conquistadors while others say the imagery stems from the days of slave masters whipping the slaves.Whatever the case may be, the diablos are said to be possessed when in costume and if you ask them their name, they will tell you that it’s “Satan”. A bit of a dark tradition but it’s all in good fun if you ask me. Experience it for yourself every February (sometimes early March) in Bocas del Toro. This year Carnaval will be celebrated March 1st-4th.